You just had a holy moment. The neat thing is that we can develop the practice of having these all through out the day. Notice I said the word: practice. St Clare of Assisi told her sisters to do this mediation for the first five minutes of every day and reflect on Christ’s total poverty on the Cross. Even the woes can be Holy Moments because they are the times of conversion. Jesus reaches into our lives and shows us what is getting in the way. These holy moments are the tough ones. For example, I was with some friends the other night and we were talking about the water main break that happened at the foot of their driveway and how this would be an inconvenience. As we talked, all three of us came to the conclusion: this was a first world problem. It was fixable and there were people who have never had water coming into their house. There were people living in drought stricken areas. A Holy Moment for the three of us! As we begin to prepare for Lent in just over three week, I would offer this suggestion: Each one of us begins the practice of having Holy Moments. Let us pray for the grace to open our eyes and our hearts to those many moments every day when God is present to us. We need some prophets…..are you ready? We live in a time in need of prophets. A prophet is not someone who foretells the future. A prophet calls the world back to the covenant God made with humanity. For the people of Israel, it was to the covenant made on Mt Sinai; for you and me, it was the covenant made on Calvary by the sacrifice of the Cross. 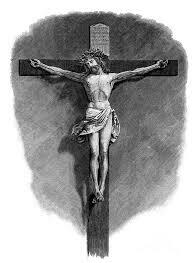 A prophet calls the world back to the Love that freely offered himself on the Cross. If you want to know what that Love looks like: re read Paul’s letter to the Corinthians, today’s second reading. This is the prophetic love of Christ. The person called to be a prophet is not someone from the desert like John the Baptist or someone who lives on a mountaintop somewhere. The prophets of today as a close as looking in the mirror. 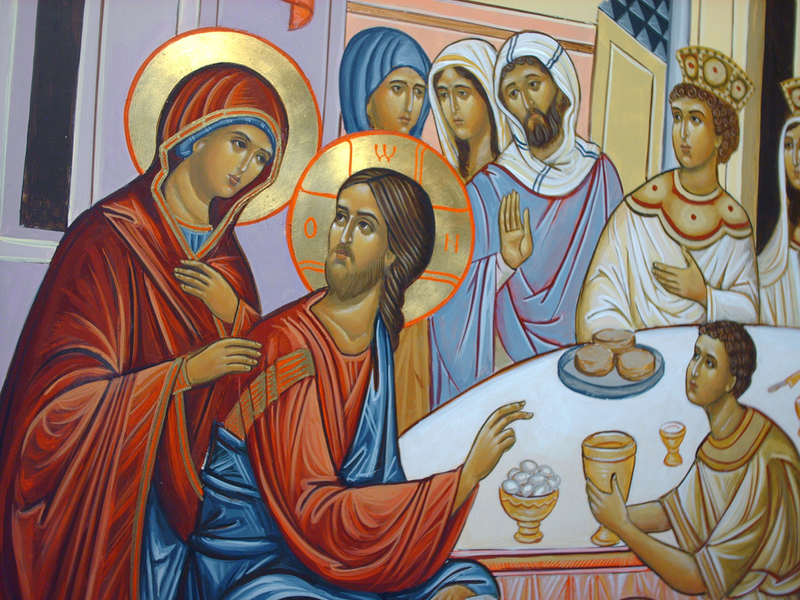 How often have you heard the words of the anointing with Sacred Chrism at a Baptism….”you share now in the ministry of Christ who is Priest, Prophet and King.” The you that is referred to is the baby or child…..but it is also you and me. We are all prophets. We are all called to refashion the world. Jesus died so that we could be free to rebuild the world by His grace. The challenge is to own who we are as prophets and live it. With the passage of the Reproductive Health Act and the slippery slope that it creates, we need to be prophetic in our stand against it. The slippery slope is an open door to euthanasia, assisted suicide, etc. This cheapening of life will also open the door to capital punishment for any reason, to a cutting a funding for social services, putting the mentally ill in prisons, etc. This Act cheapens life in all its stages and erodes one of the primary beliefs of our faith: that each person is created in the image and likeness of Almighty God and therefore deserving to be treated with respect and dignity love. A prophetic stance demands we work across the board for every single human person in the world. This is Christian Love….and here will be true test of our prophetic call. How we will treat those who have chosen to make these laws and those who disagree with us? Yes, we need to be angry, but our anger needs to be used to build and not hate. Violence will solve nothing; anger that is repressed in our hearts will destroy us. Our anger needs to empower us to be stand up and be heard; to get involved in changing our world. Again, I refer us all back to today’s Second reading…..this is the blue print of how we are to be prophets. As prophets, we risk being seen as naïve and out of touch. As prophets, we must dare to dream that the Kingdom is real. We must risk that God will use us to be the ones who build His Kingdom. I dream of a society in which we have alternatives to all these social ills; a place where a woman is treated with dignity and not an object, where babies are seen as the future not a problem to be dealt with, where a poor person is given the opportunities to a different life, a felon is able to leave prison and rebuild his or her life, a drug addict is able to have services and support in his or her recovery a woman who has had an abortion finds healing, acceptance and forgiveness in our midst, etc.…..as prophets, we have the mandate to not only talk about this Kingdom. God empowers us to make it happen. This is what a disciple does. He or she or me gets their hands dirty and works side by side with people of different faiths, color, race, whether they come to Mass or not, whoever and love this world into a better place. It is up to us to roll up our sleeves and do. People may threaten to throw us off a cliff; but we will be in good company: the crowd wanted to do that to Jesus. Can we expect anything else? Water into Wine? Problem into Grace? God can transform anything in our lives into grace. It would have been a gr eat embarrassment to the wedding couple and their families if they had run out of wine. They would have been dishonored. On the surface, it looked like an insurmountable problem. To God, hardly. Through the intersession of the Mother of God, Jesus transformed a problem into a sign of the abundant grace the flows out into the world from His divine heart. Jesus can do the same thing for each of us. We all have things we deal with on a daily basis that can seem overwhelming and unsolvable. Do we ask God to give us the grace to deal with whatever it is? I am convinced that God doesn’t solve the problem but gives us the knowledge and grace to do it. Everyday we encounter small changes that we think we must solve alone. We don’t. We have the intercession of the saints and God’s grace to depend on. It could be that the Holy Moment we want to work on this week would be to ask God to help us solve on problem that comes up every day. The problem doesn’t need to be as big as a wedding running out of wine, but something we are struggling with. 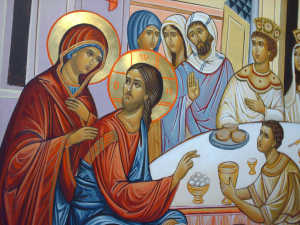 The wedding feast of Cana is the manifestation of the power of God that is active and alive in the world. Like Jesus was the sign of the Father in his time; we now are the signs of Jesus in our time. Like he changed the water into wine, the grace of God can change the world through His grace that flows within each of us. In each situation that we encounter this week, if we are open to letting God use us, the water of grace will transform it into the wine of His presence. Let us be the instruments of God’s grace this week so he can transform the world. We are all familiar with the three gifts of the Magi: gold, frankincense and myrrh. 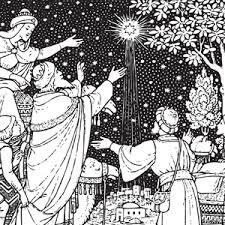 Some say that they are symbols of who Jesus is: the gold acknowledges his royal dignity as the King of the Universe, frankincense proclaims his divinity and myrrh is the foretaste of His redeeming death and burial. But, what do the gifts mean for us today? “Jesus wants us to give him “gold” by “shining in his sight with the light of wisdom”. This gift of the Holy Spirit is the gift to understand life and creation as God does. When we strive to see the world as God does, we are able to make decisions based on the values of the Gospel. We offer God the gold of our lives by serving him with every moment of our lives. All our actions, all our decisions, our views, everything is for the honor and glory of God. God asks us to offer the fragrance of our prayer every single day. We are called to offer God the very scent of our lives; we are to offer to God the smoke of our joy and sorrows, our hopes and dashed dreams, all every moment of our lives. Finally, from Gregory, we learn that the “myrrh is symbolized mortification of the flesh. We offer myrrh when we offer up the desires of our flesh”. So, what does that mean to us? This means we give up the things that get in our way of following Christ even when it causes us discomfort. Fasting from the computer, our phones, etc. are not comfortable for us today, but when all this gets in our way as growing in the spiritual life, then we need to make a choice. We fool ourselves into thinking that the only time we give something up or do without is during Lent. However, it is a necessary part of our spirituality every day. Not because we must, but, because we want God that much in our lives. Abstaining from meat on Friday was a mortification to prepare for Sunday, the one hour fast before Communion is doing with out to receive something greater and more important than food. It is interesting that we all can agree that going on a diet is good for our physical health, Gregory and the gift of myrrh asks us to see that going without is vital for our spiritual health, too. The mystery of the gifts is a challenge for us today. As a community of faith, may the wisdom of God direct every moment of our lives as disciples of Jesus. Let us offer the sweet smell of our prayer at home and here at our worship of the altar. Finally, may the sacrifices we make for God be a sweet offering to the One who gives us all. Over the last few days, most of us have been around our families. There have been laughs, tears, arguments, disagreements, some of the normal drama has arisen to the surface; but, no matter what, whether we like them or not, they are our families. The Christmas season reminds us that Jesus was born into the messiness of time and life. He was born into a human family of a mother and father, aunts and uncles, grandparents and cousins, and family friends. They had the same laughs we had over the last few weeks and the same arguments; they shed the same tears and laughed as we did. Like them, the holiness of our families is found in the reality that Jesus is in the middle of it all even when he is not acknowledged. The family of the church is no different than our families and the family of Jesus. What makes the Church a Holy Family is the reality that Jesus is the foundation of the family of the Church. it is here in the family of faith we learn to pray and to know Jesus. here we share the banquet of life. here God says that to each of us in the life of the sacraments. Family life is intrinsically linked to the life of the family of faith: the Church. Each depends on the other; they can never be separated. Remember the saying of Fr Peyton: The family that prays together stays together. In the new year, we need to beg God to touch the hearts of the families of those who do not come to worship. We need to ask the Mother of God and our Mother to wrap them in her mantle of care, so they know the Love she brought into this world. We need ask St Joseph to lead them like any father into a life that will bear fruit. Without our absent brothers and sisters, we cannot be the whole Body of Christ. The family of the Church misses and cares for them. We need to let them know exactly that. To believe in Jesus and be proud and open about it, to love as He loves, and to keep his commandments are what will make us a Holy Family of faith. May the Lord grant us the grace to be transformed into the mystery of the Holy Family of Nazareth. May Jesus always be the very rock and center of all we do as a family of faith; here and now.